After a 17-month hiatus, AMC’s Mad Men is coming back to the small screen this Sunday at 9pm for its fifth season – and New York City is excited about it. To celebrate the return of our favorite ad men (and woman), we’ve rounded up a few parties and promotions at NYC hotels, and in true Mad Men style, from packages to mixing classes there’s no shortage of booze. 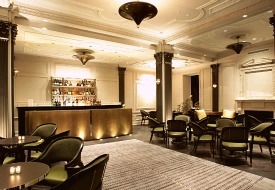 For the full Mad Men experience, consider The Roosevelt Hotel’s Mad Men in the City package (www.theroosevelthotel.com). You’ll get to stay in a renovated room and enjoy 60s-style cocktails at the Madison Club Lounge and mad46 rooftop bar, two tickets to the Paley Center for Media (formerly the Museum of Television and Radio, and before that the Museum of Broadcasting), Mad Men season 4 on DVD to take with you, and a copy of The Unofficial Mad Men Cookbook so you can make those cocktails (and food that featured on the show, as well) for yourself at home. The offer is valid until June 30 and starts at $425/night, with a three-night stay minimum. To kick it off, there’s a Mad Men season premiere viewing party on March 25 from 7-11pm in the Madison Club Lounge, where Don Draper spent many a night (and day) enjoying the bar after Betty kicked him out and he made The Roosevelt his temporary home. The Pierre, where Sterling Cooper Draper Pryce launched and where Peggy and Duck had an – ahem – encounter, is also getting into the Mad Men fun with a new cocktail menu at the bar and lounge, Two E (www.tajhotels.com/pierre). The $14 drinks are inspired by the show and include classic cocktails like Roger Sterling’s staple Irish Coffee (Bushmills Irish Whiskey, rich simple syrup, coffee, and whipped cream), and the Christina Hendricks/Joan Halloway inspired Bikini Martini (Hendrick’s Gin, Peach Schnapps, and Curacao Blue). The cocktail menu premieres with a party Tuesday, March 27 at Two E from 6:30-9:30pm. Sixties outfits are encouraged, so wear your best Betty dress or Don suit. If you can’t make it on the 27th, though, don’t worry: The Mad Men cocktail menu will be available throughout the airing of season 5. To throw your own Mad Men parties, you might be interested in the Astor Center’s Mad Men themed cooking and cocktail mixing classes. If you’re quick, you can grab one of the few remaining seats for the Dinner with MAD MEN: Hands-On Cooking & Cocktails class with Carl Raymond. There’s only one, and it’s this Saturday from 12-4pm, just in time for you to learn some techniques for an at-home premiere party. The class is $129 per person and features food trends and dishes of the 50s and 60s like Polynesian pork and baked chicken Supreme. If you don’t make it for that class, though, you can also opt for the Time Travel Happy Hour: Mad Men Cocktails Class with Jenn Smith. The price tag is smaller, at $79, and since it’s on March 30, from 6:30-8pm, you’ll still have plenty of Season 5 viewing parties left where you can wow your friends with your Tom Collins and Old Fashioned mixing skills. For general trip-planning information, see our New York City destination guide, then use our Travel Search price comparison tool to find the lowest rates on hotels, flights, and vacation packages in New York City.